Welcome to my website! 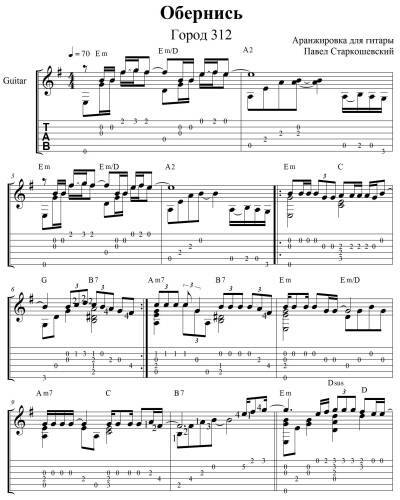 Guitar sheet music and tabs, that are available here at the moment, include Russian and foreign songs. The list is constantly updated, and one day you’ll find guitar sheet music for your favorite song. If you would like to get an idea about guitar sheet music, you can find some fingerstyle interpretations (free of charge) under the list on this page. When do you need guitar sheet music? You have decided to learn guitar more deeply and get more educated. You are trying to find a way to quickly learn the names of the notes on guitar fretboard. You can quickly remember the names on the notes while learning your favorite songs. Are you looking for an alternative to classical works on the Internet? Do you always find guitar music sheets for classical guitar? Then you’ve come to the right place! Do you want to sing popular songs with friends, but think that you have no voice? In this case guitar sheet music is what you need. Playing guitar will produce even greater effect on the audience. You would like to understand the logic of chord structure and want to find them on guitar fretboard, to change them and to make them by yourself. This will allow you to make guitar arrangements by yourself. Without knowing of musical notation it is just impossible. You learned how to play by tabs using Guitar Pro and would like to develop your skills and learn notes. Having spent some time on learning notes, you can always please yourself and your friends, playing your favorite songs on guitar and generally feel more confident and relaxed.